Disgraced sprinter Marion Jones has handed over the medals she won at the 2000 Olympic Games in Sydney, the US Anti-Doping Agency has announced. Jones has also accepted a two-year ban, although she announced her retirement last week when she admitted taking steroids to a New York court. 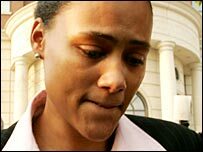 Jones confessed that she had taken tetrahydrogestrinone (THG) from September 2000 through to July 2001. The 31-year-old won three golds and two bronzes at the Sydney Games. The golds came in the 100 metres, the 200 metres and the 4x400m relay, with bronzes in the long jump and the 4x100m relay. Jones has said the THG she took, also known as "the clear" because it did not show up in doping tests, came from the San Francisco Balco laboratory that was at the centre of US sport's biggest doping scandal. The US Olympic Committe has asked the athletes who competed with Jones in the relays to return their medals because, USOC chief executive Jim Scherr said, they were won unfairly. But he added that only athletics' governing body the IAAF and the International Olympic Committee could order the return of the medals. "The outcome of this story is a valuable reminder that true athletic accomplishment is not obtained through cheating and any medal acquired through doping is only fool's gold," said USADA chief executive officer Travis T Tygart. The IOC will also have to decide whether the athletes who finished behind Jones should be awarded Jones's medals. Greece's Katerina Thanou, who finished second to Jones in the 100m, later served a two-year suspension after missing three tests. Jamaican Tayna Lawrence won bronze. If Lawrence were elevated, Merlene Ottey, who finished fourth, would be in line to add to her record of eight Olympic medals. The Jamaican born sprinter, who became a Slovenian citizen in 2002, tested positive for the steroid nandrolone in July 1999 but was cleared by an IAAF panel which criticised the laboratory involved. The IOC's executive board will meet on 10 to 12 December to decide what should happen to Jones' five medals. Jones pleaded guilty to two felonies in the New York court case - lying to federal investigators about her steroid use, and lying about a separate fraud case. She faces up to six months in jail under a plea bargain and will be sentenced in January. Last week, IAAF president Lamine Diack said Jones will be remembered as "a fraud". "If she had trusted her own natural gifts and allied them to self-sacrifice and hard work I sincerely believe that she could have been an honest champion at the Sydney Games," he said. "Now, instead, she will be remembered as one of the biggest frauds in sporting history." The US Olympic Committee said it had written "a letter of sincere and humble apology to the 205 national Olympic committees and in addition, a more extensive letter to the people in Australia, apologising to the organisers, the volunteers and the Australian people".